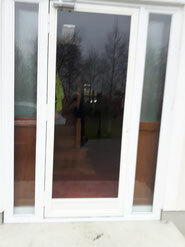 We have just fitted our 50th '' Storm Door'' - a refined powder-coated, colour- coded aluminium screen door, usually fitted onto its own extension framing, which can be fitted outside of any door to help protect the existing door from the elements during winter months – has been available in Ireland since 1995. This door can eliminate the possibility of having to change your beautiful hardwood door. 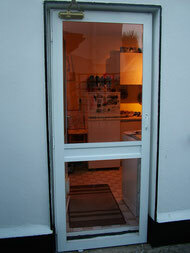 The Storm Screen Door, fitted independently of the existing door (on drop-pin cast steel hinges), can be removed easily for the summer months if necessary. Available as standard in a choice of white or brown and all RAL colours can be matched at extra cost.